I’d like to apologize in advance to any Southerners reading this. 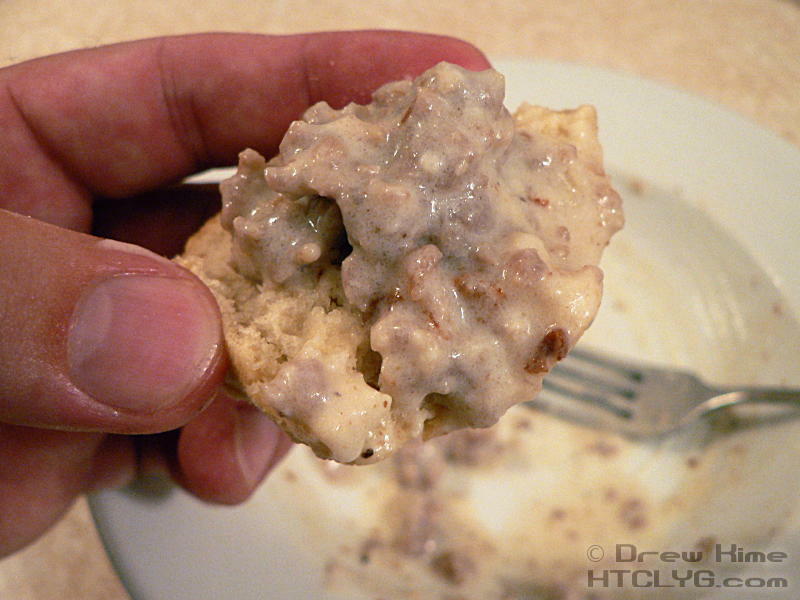 Yes, your Grandmother’s biscuits and gravy were better than anything I’ll ever make. I don’t deserve to even call this biscuits and gravy. I’m a damn Yankee, and I should stick to beef stroganoff and croutons. Good, that’s out of the way? 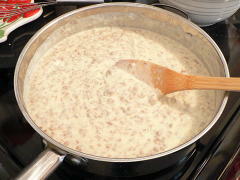 Now, if you don’t already have your own tried-and-true sausage gravy recipe, this one should do just fine for a start. 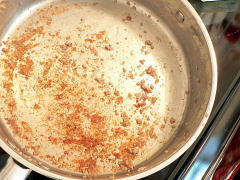 Cook the sausage over high heat in a stainless or cast iron pan. Don’t use non-stick, you want to get brown bits. 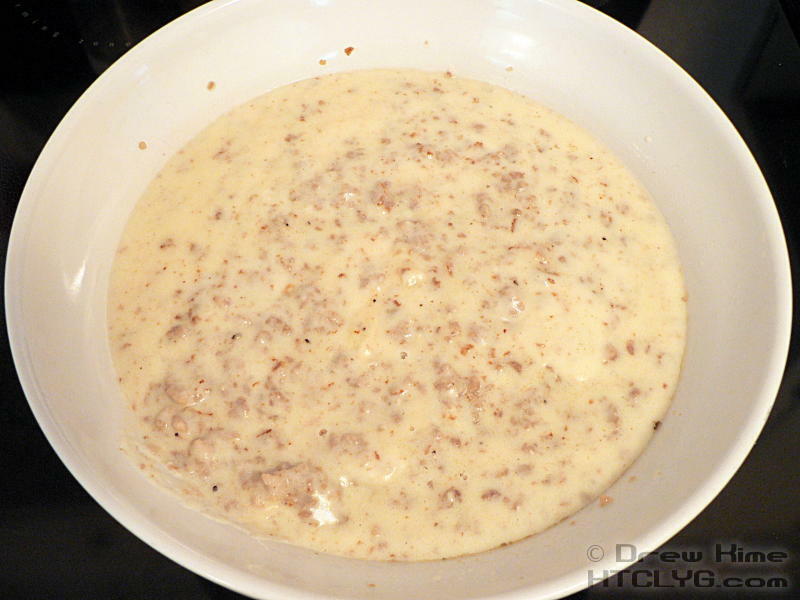 Crumble the sausage up as much as possible. That’s the Pampered Chef Mix ‘N Chop I’m using. Absolute best thing I’ve found for breaking up ground meats. 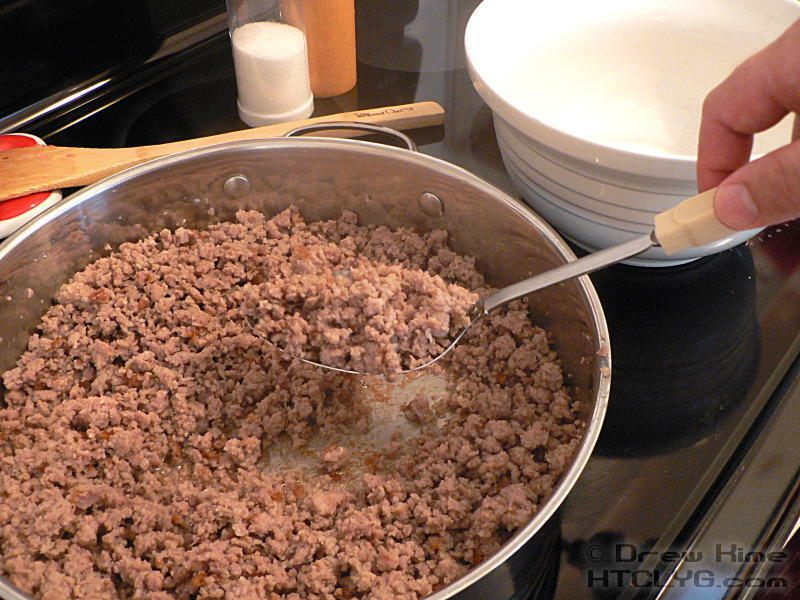 Once the sausage is browned all over, remove it to a bowl using a slotted spoon. (Use the same serving bowl you’re going to put the finished gravy in.) 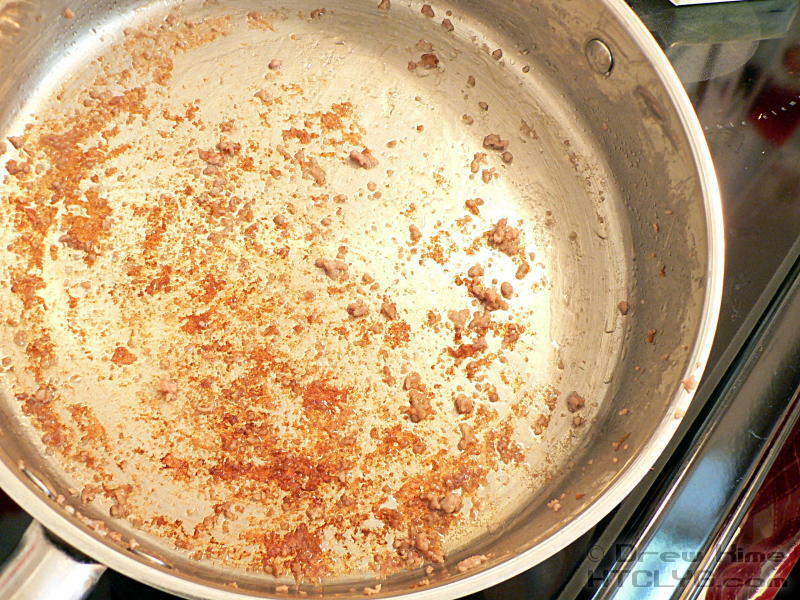 Leave the rendered fat — okay, the grease — in the pan. 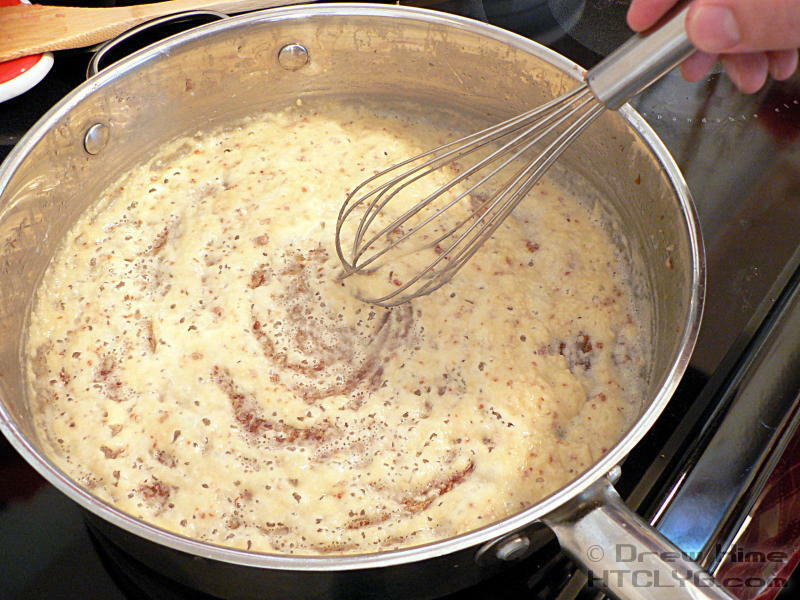 You’ll need it to make the roux. Now you can see those brown bits I mentioned. That’s pure flavor right there. 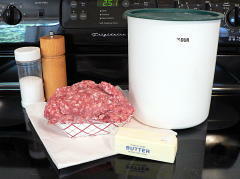 You can also see I didn’t have much grease left, so I upped the butter. 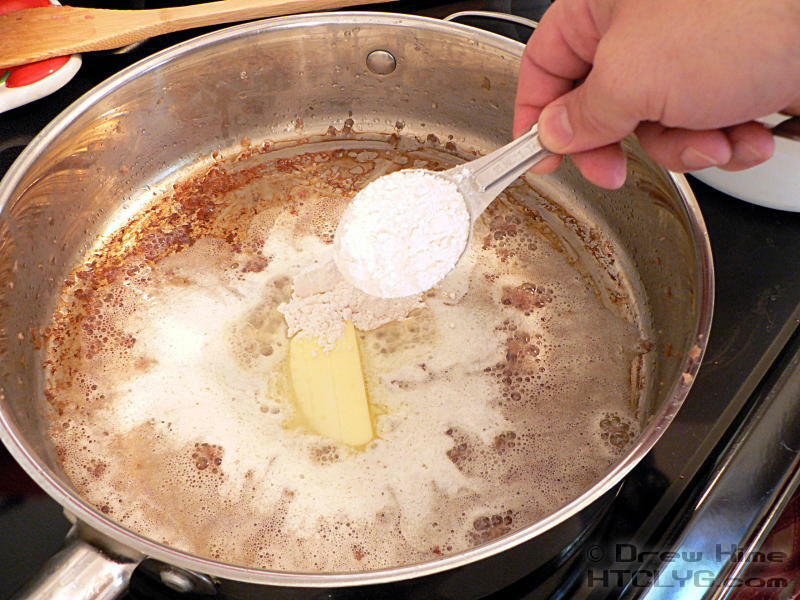 You want about one tablespoon of fat for each tablespoon of flour. Add the butter and return the pan to low heat. Seriously, turn it down. You don’t want to burn your roux. When the butter is nearly melted, add the flour and stir. 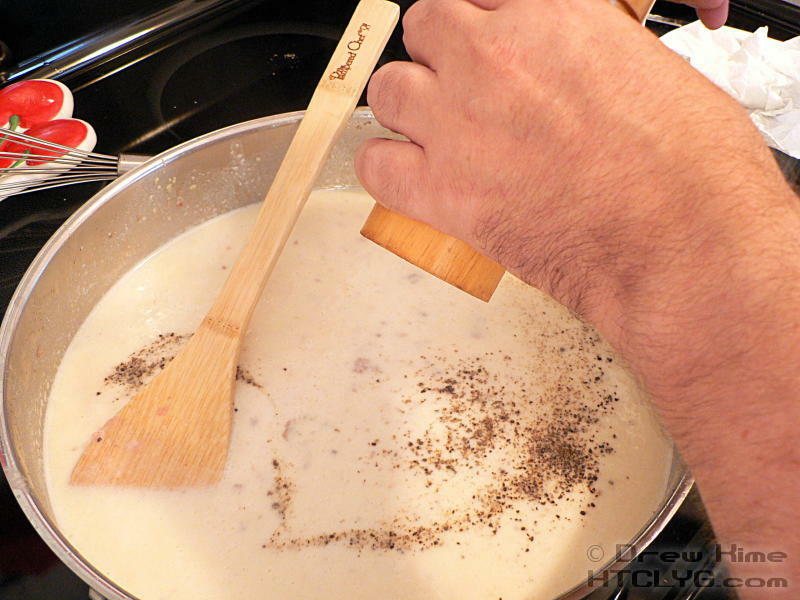 Keep stirring until the flour is completely incorporated, and the roux starts to turn the barest shade darker. 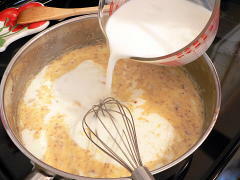 Add the milk, turn the heat up to medium, and scrape up as much as you can of the bits stuck to the bottom of the pan. 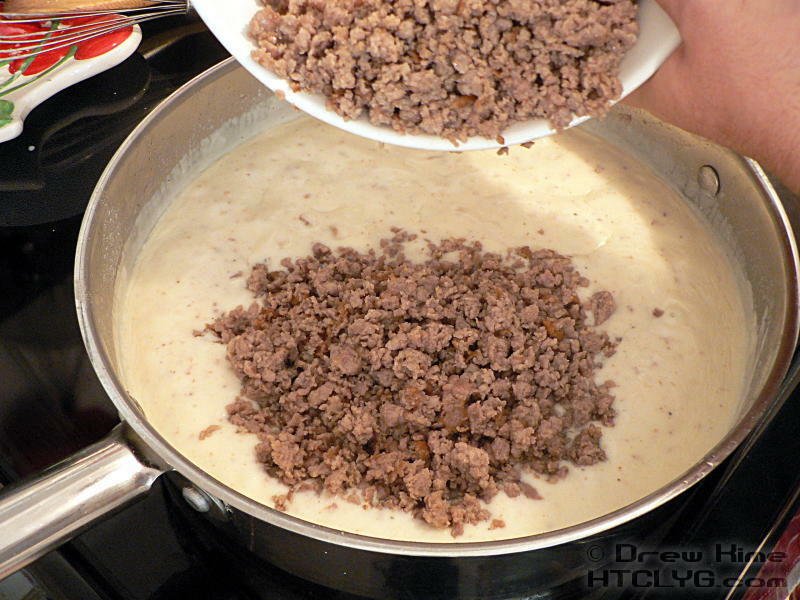 Add a generous helping of fresh ground pepper and, depending on how salty your sausage is, add salt. Keep stirring over medium until the gravy starts bubbling steady. 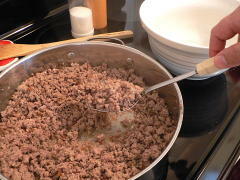 Add the sausage back in and stir until the sausage is warmed back up. 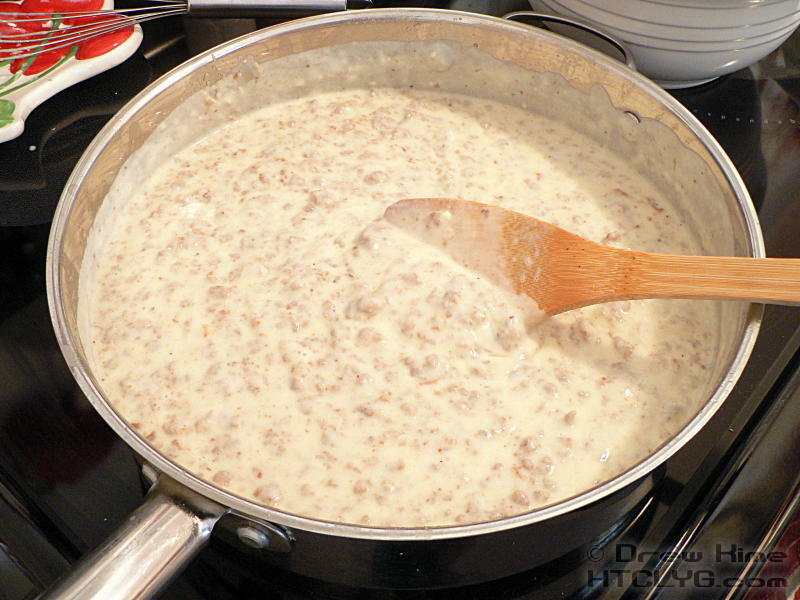 Transfer the sausage gravy to a serving bowl and cover it with a plate to keep the heat and steam in. 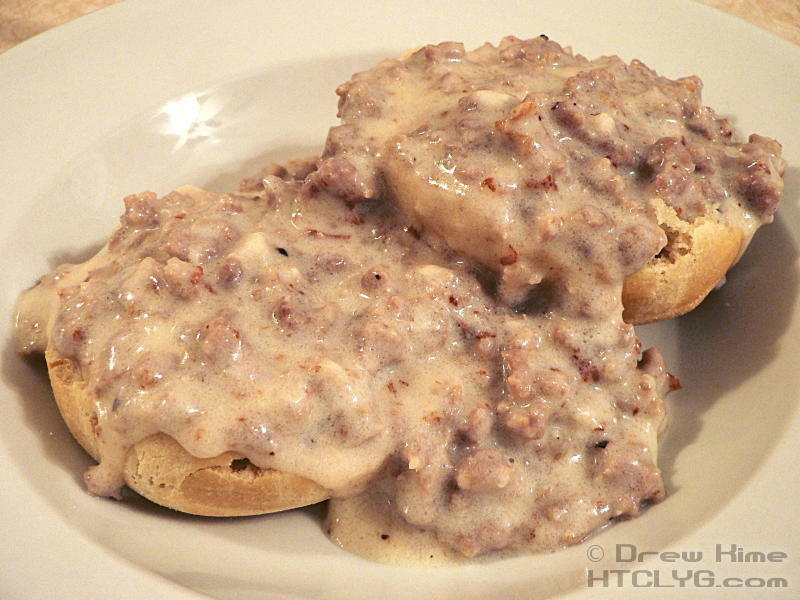 Rip the biscuits in half and cover them with sausage gravy. Because it was my first time making them — and yes, because I’m a damn Yankee — my biscuits weren’t flaky enough to cut easily with a fork. Good buttermilk biscuits are light and fluffy all the way through. Mine had a delicious, but slightly chewy, crust. 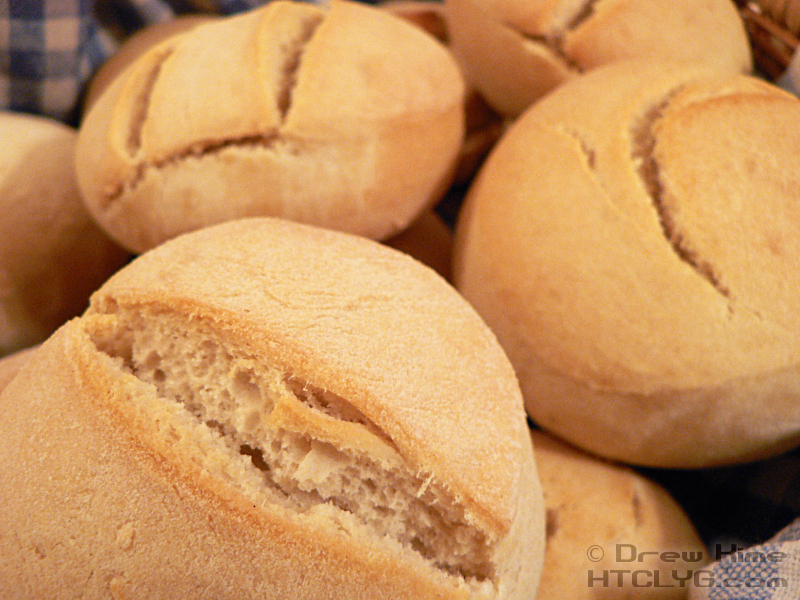 Great for a dinner roll, not so much for biscuits and gravy. So I used them for scoops instead. 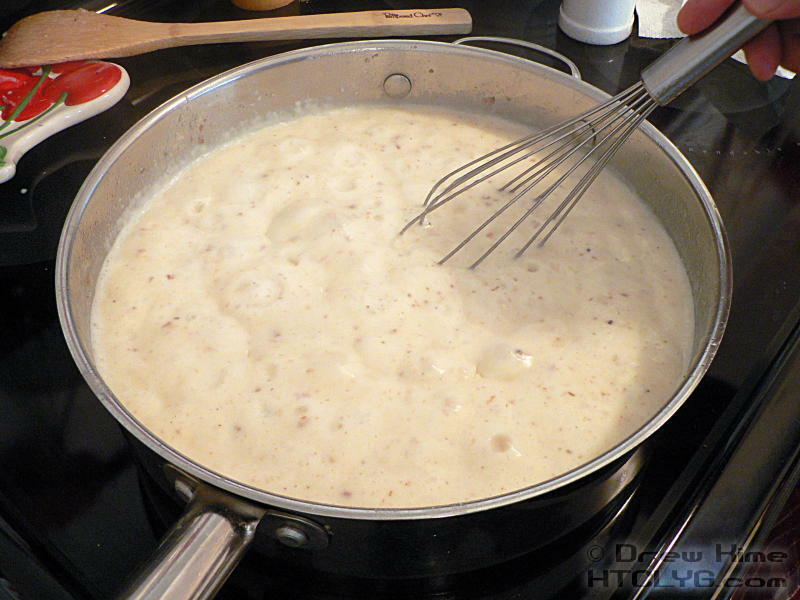 If this recipe offends the memory of your Nana … If you’d like to list all the things I did wrong … If you want to tell me I forgot to put the milk in the ingredients picture (yeah, I noticed) … Comments are open, let’s see what you’ve got. Brown the sausage in a heavy skillet. Remove the sausage but leave the fat. 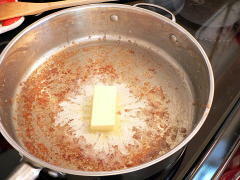 Add the butter and lower the heat. 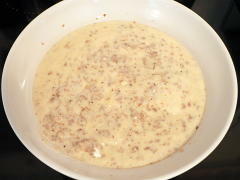 Sprinkle the flour in, mix well, and cook over very low heat until the mixture just starts to turn darker. 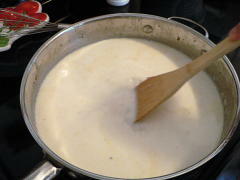 Add the milk, season with salt and pepper, and heat over medium heat until it starts bubbling. 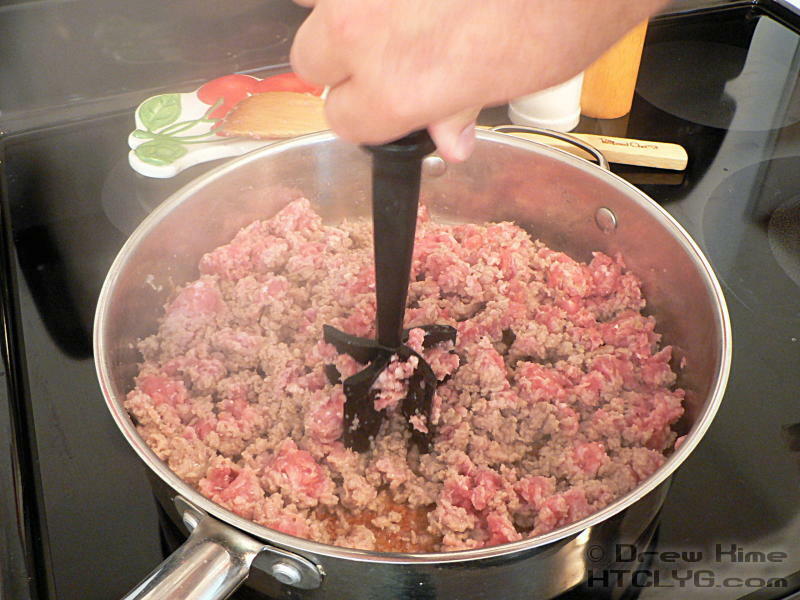 Add the sausage back in and stir until the meat is warm again.